Are changes in wintertime climate random or predictable? Winds and temperatures in Earth’s atmosphere vary from month to month and year to year in countless ways. Decades of monitoring the weather and climate have revealed a few simple patterns that explain much of this variability. 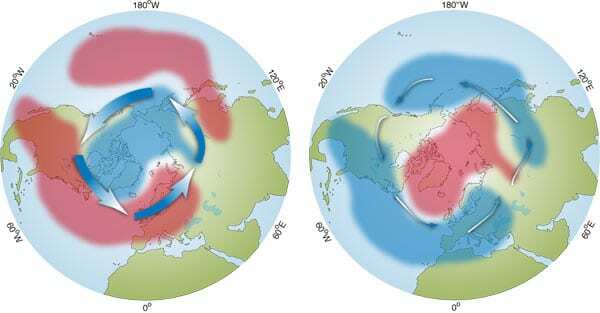 The severity of wintertime climate over North America and Europe, for example, has been strongly linked to the most prominent atmospheric pattern in the Northern Hemisphere, which is called the “northern annular mode.” It is a natural shift of air masses back and forth between the North Pole and mid-latitudes. At some times, we see a surplus of air mass and pressure over the pole and a deficit at around 45°N; at other times, the air mass is redistributed to create a deficit at the pole and a surplus in mid-latitudes. This seesaw exchange of air masses shifts temperature conditions and storm patterns throughout the region. The pattern of this exchange may change from one week to another, or it may recur for several winters in a row. There even seem to be long-term trends in the pattern that continue for decades. So, in many cases, we know the what, where, and when of these atmospheric patterns. But how and why these patterns happen is less clear. Many scientists have investigated the driving forces behind changes in the northern annular mode and a similar pattern of changes, called the “southern annular mode,” that occurs over Antarctica and the Southern Hemisphere. If we can comprehend the physics behind these changes, we might someday reach a point where we can predict not just the weather, but some aspects of longer-term climate. But there are more basic questions to answer first: How much of the annular mode fluctuations are a purely random result of atmospheric weather, and therefore inherently unpredictable? Can we discern true patterns in annular mode fluctuations that occur more frequently than can be explained by simple chance, and therefore could be predicted? We often begin our conceptual leaps by making models. When we simplify complicated observations down to a few basic physical mechanisms—like the spare lines of a cartoonist’s sketch—we can often see the world more clearly. Even better, by looking at where our simple models fail, we can more easily figure out what parts of our understanding are lacking. Suppose I stand in a long hallway and flip a coin over and over again. When the coin comes up heads, I take a step forward. When it’s tails, I take a step backward. My position over time would naturally fluctuate back and forth. This sort of cumulative randomness is known as a “stochastic process.” Similar processes occur widely in nature, as well as in engineering and economics, and can be very misleading. They often appear to show long-term trends, or hints of periodic oscillation, even though nothing is going on except purely random behavior. As we try to analyze the fluctuations in the annular modes of the atmosphere, we have the same problem: What is random, stochastic fluctuation masquerading as a pattern, and what is truly a pattern with identifiable and certain causes? For instance, the winter atmosphere is full of storms that last a few days. These storms can be predicted a few days in advance, but over the duration of an entire winter, they are random and unpredictable. The winds in these storms move air around as a random process. If we imagine a line of latitude encircling the pole, we would observe that global storm activity sometimes will move an excess of air north across the line, and sometimes it will move more air south across the line. That means our winter storm activity randomly adds or removes air mass from the polar atmosphere. This is a stochastic process, just like my random walk down the hall. 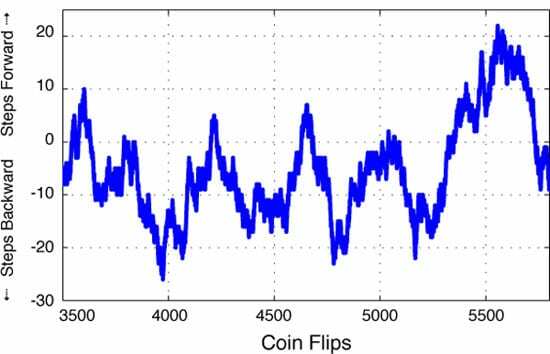 To understand what the annular modes mean to the bigger picture of global climate, we built a simple mathematical model of a stochastic process, not much more complicated than our coin-flipping hall walker. We input the random north-south motion of air caused by daily storm activity, ran a series of mathematical equations, and tried to produce an output as similar as possible to the annual mode fluctuations we observe in reality. There are some unknowns in this model, such as: At what latitudes, and what altitudes, should we measure the poleward motion of air? And, if, by chance, we get a long series of storms with net poleward air motion, is there some “leakage” of air back to the south? (After all, air mass can’t build up at the pole forever.) These unknowns can be thought of as control knobs that we can adjust and “tune” to get the best match between the model’s output and the real-world annular mode changes. After running our model, we found that a great deal of the fluctuation of both the northern and southern annular modes (and the weather patterns they spawn) can be explained using the “random walk” idea. But there were some noticeable departures. Intriguingly, we found that the air mass motions that drive the annular mode are not just like flipping a coin. In some cases they’re slightly non-random, depending on the state of the annular mode; it’s as if my coin was more likely to come up “heads” when I stood at one end of the hallway, and more likely “tails” at the other end. That sort of behavior can lead to long-term, semi-random oscillations in the climate that, in principle, may be predictable. This means that the annular mode is a complicated mixture of both random wobbles caused by weather events and of other, possibly more predictable, interactions. Our simple model cannot tell us exactly what these interactions are, but it does indicate that there may be interesting climate-changing phenomena out there that we’re only beginning to investigate. This research is funded by the WHOI Ocean and Climate Change Institute.